Some exciting news in central Idaho today – The Phantom Hill wolf pack made an appearance over the weekend igniting excitement from valley residents and wolf watchers. The Phantoms were in view – word got around and it was a wolf jam at the best viewing place. Then, this morning an incredible thing happened – the Phantoms took a mountain lion. 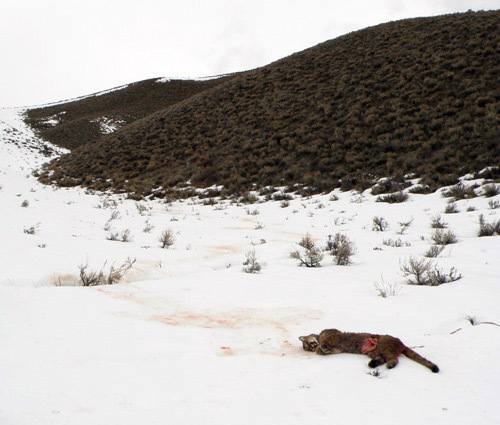 The young mountain lion, was likely feeding on an elk carcass several weeks old (evidently not killed by wolves because the skeleton was intact and various internal organs were laying frozen on the snow by it still today) about 60 yards up the draw from where the following photo was taken. The cougar apparently didn’t notice the approach of the wolves. Thanks to Lynne Stone for sharing ! Wow, incredible photos. So the wolf pack left it for eating later…………? I was wondering if they would eat lion or maybe they prefer the elk they just stole from it? All I can say is WOW, that is an amazing outcome! I really can’t say that I have heard of a wolf pack killing a Mountain Lion for a long time.. Thank you Lynn, I would like to hear some more details and I hope they are forth coming! I wonder how many lone wolves are killed by mountain lions that we don’t know about. Wow – outstanding photos, Lynne! What a treat for the folks up in K-town. One of the original wolves reintroduced from Canada to Idaho was killed by a cougar in Montana. I don’t know where you heard that but I have seen instances where mountain lions have drug winter killed deer away. I think it is common that cougars eat carrion as it is easier to kill something that is already dead and dangerous to kill a live animal. An update to the Phantom Hill wolves and cougar story. IDFG picked up the carcass of the cat. It was a male, probably about 2 years old, weighed 80-100 lbs, had an IDFG ear tag, and was the same animal that had been seen near someone’s porch earlier in the winter. 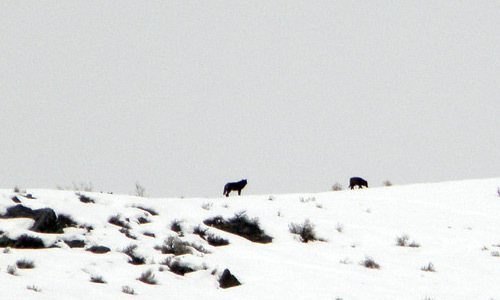 Mountain lion sightings are fairly common in the Wood River Valley, especially during the winter. Last night, Monday, I watched the nine black Phantom Hill wolves as they moved for a couple of miles across the foothills through the sage and snow, to return to the draw where the cougar had been. The wolves have now been in view for four days. They are gorgeous black wolves consisting of the breeding pair, 2-year male and six subadults. The papa wolf, B333, is an elderly gent with gray cheeks and chest. I can see the wolves right now from Ketchum, although they are a couple of miles away, high on a ridge, napping away on this warm sunny afternoon. This morning IDFG law enforcement and Sun Valley police were in Elkhorn Village (which is part of Sun Valley) watching the Phantoms, who were about a mile distant and very visible on the snow. There are a lot of elk in Elkhorn. So far, I’ve only heard positive reaction from officials and citizens. The Mt. Express sent a reporter and photographer to the cougar scene so there will be a story in tomorrow’s paper. I wonder how many mule deer and elk that cougar would’ve killed had it lived out its life without wolves? IDF&G should take note and update its recent assessment of the cost of wolves (in terms of elk hunting opportunities) accordingly. Famous YNP wolf 163M was killed by a lion, apparently he tried to feed on a bighorn that the lion had killed, if my memory is correct. Starting to seem like a long time ago. What make you think it wasn’t a wolf kill? They leave carcasses behind like any other predator. I feel sorry for that lion as I have seen what they can do to a coyote. I consider lions to be one of the most magestic predators we have in Idaho. The lion would have taken fewer animals in its life than the wolf. Typically a lion will kill an animal a week where wolves will take an animal every couple of days. Myself and the others who walked out and looked at the mountain lion, felt sad for it, just as we feel sorrow for all the wolves that have been shot since reintroduction. As one of the IDFG folks said, the mountain lion was simply in the wrong place at the wrong time. I would suspect that the Phantom wolves had been observing the mountain lion moving through the vast open terrain that lies in the Pioneer Mountain foothills adjacent to Elkhorn Village. When I saw the nine Phantoms on Monday morning, they were in the sage above the mountain lion. The wolves moved on when I came up the road. The elk carcass that the lion was near when jumped by the Phantom wolves, had been there for weeks if not months. There was only left the intact skeleton, wads of elk hair and amazingly, chunks of liver laying on the snow. Wolves had not killed this particular elk. For the record, mountain lions can be hunted with hounds in Idaho and lion hunters are some of the most vocal opponents of wolves. The last dead mountain lion I saw, was one my nephew shot in his machine shop on the family wheat ranch in Oregon. The lion was hunting feral cats that are prolific around most rural ranches. It was the Colorado D.O.W. that said lions don’t eat what they haven’t killed themselves. We had a lion preying on our lambs & hens, and the man who came to set a trap said that it couldn’t be baited with just any meat. It had to be the lion’s own kill or something live. Did you see the elk die? Just because the lion is hunted and the numbers are controlled doesn’t take away from its majestic nature. The wolves that have been taken since reintroduction had a reason for their removal as the USFWS only removes wolves that are in conflict. It’s worth mentioning that this incident in Parker Gulch is spitting distance from the de facto elk feedgrounds in the Sagewillow subdivision. 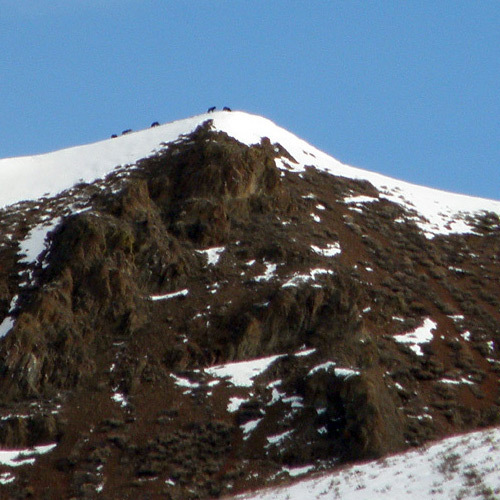 When you have 100+ elk camped on the same ridge all winter, the meat-eaters are going to hang out there in greater concentration than would otherwise be the case. In his book The Beast in the Garden, David Baron says that the reason lions (usually) run from hounds is because, as they were evolving along with wolves, the wolves had the advantage of numbers and were often deadly to lions. Shane, wolf PACKS take an animal every couple days…on a per animal basis, kill rate is likely pretty similar between lions and individual wolves (not packs). That is exactly true Jay. I’m glad that you pointed that out. Lions and wolves do kill the same amount of game on an individual basis. And there are seasons in place to control lion populations so that they do not over-populate and deplete the local game population. How long do you think it will be till there are rules and procedures in place to prevent over-population of wolves and an eventual collapse of the prey base leading to a rapid starvation of the predators (coyotes, lions, bears, and wolves)? I’m with Lynne on this one, I felt for the cat just seeing the picture. Perhaps had he looked up a moment sooner I would think he could of easily outrun the wolves. Why is it wolf haters all think pro-wolf folks only like wolves. I get a sick feeling when I see any animal dead on the road. And Shane I have seen video on how they “control” lions. Let radio collared dogs chase and terrify them until they climb a tree and some “sportsman” comes and shoots them out of it. Well, if you look at the Northern Yellowstone information–an area also have the rare distinction of having intact all its native predators (g. bears, b. bears, wolves, lions, coyotes, bobcats, etc. )–there hasn’t been a “crash” as you elude to. Sure, the prey densities have dropped, but data from the last several years have shown the elk population has stabilized, abeit at a lower density. So this notion that somehow the wildlife world is going to go to hell if man doens’t step in and manage them doesn’t always hold water. I might also throw in that fewer elk has been beneficial for mule deer, as indicated by MT FWP study that suggests deer are increasing due to the reduced competition with elk. I think ultimately what your arguing for is fewer predators so that people can have a bigger share of the pie. I’m curious, how did predator populations regulate themselves prior to modern hunters? As Ed Bangs is fond of saying, if wolves were going to eliminate their prey, they would’ve done it 10,000 years ago. Wolves don’t elimate prey they elimate competition be it other wolves or predators. Look at the recent numbers of wolf decline in the northern range interpack strife and disease causing a decline. Watch a pack of wolves around a griz and her cubs given the chance they will kill the cub in a heartbeat. Hunters don’t want all the pie they want their voice herd. Wolves are creating gaps in ungulate populations that had been previously only kept in check by hunting. Now that wolves are viable ungulates are on the decline for the first time in 50+ years and there is no denying it. Wolves are a leading factor in ungulate decline and not just elk try whitetail or moose too. These things are bond to happen its nature and its wild. Wolves can’t manage wolves like they did 10,000 years ago humans hadn’t shown up. A wildlife needs managed to some extent because of the human element. This cat was killed by natures way, but wolves can’t be left unchecked because we enjoy watching them. Nor can any other species for that matter. Hunters and sportsman do as much to protect their rights as do these wolf only people. All animals in the ecosystem that supports humans requires mgt. mother nature can’t fix the human element, but we could sure give her a break once in a while. Hoosier, you’ll never hear me say wolves don’t have impacts, I was just responding to someone else’s suggestion that “if we don’t do something quick they’re gonna decimate the (Elk, Deer, Moose, Caribou–take your pick)”. However, predator-prey dynamics are a helluva a lot more complicated, and I hear too many hunters pointing the finger at wolves, when there are: cougars, bears, coyotes, and humans also contributing to the mix. So no, it’s not just wolves that have caused declines (and there are plenty of cases where prey is doing just fine with wolves). Hunters kill 20,000 elk a year in Idaho (those are just the ones taken legally, not counting poached or wounding loss), do you think that plays a role? Hunters don’t want all the pie they want their voice herd. Wolves are creating gaps in ungulate populations that had been previously only kept in check by hunting. Hunters are of a diverse mindset – sorta like everyone – and sorta like everything, it’s the whiners that get ‘herd’. it seems to me that the habitat, for any number of reasons – but i like to talk about cattle & sheep because i’ve seen so much of it and i don’t hear a lot of others saying much publicly – is in such a condition in a lot of places that big game carrying capacity is diminished across a lot of landscapes – so long as that’s the case why not figure a way to ‘manage’ away the reasons for that ? these are the causes of lost opportunity that are in need of such a heavy handed management. do you know that on BLM landscapes over 90% of the forage is allotted domestic animals ? cattle & sheep. how much big game do you suppose a landscape restored from that fact might support ? Nobody is alarmed at the ignorant response of this mayor in Ralph’s follow-up article? I hate to think what he is implying by his questions and his presence. I have documented proof of lions that live less than a mile from my house, yet I believe they belong there. You take precautions, watch your kids, and teach them to watch out. Somebody going out and killing the lions in the immediate vicinity does not guarantee their safety. Lions move all the time. I’ve never seen these lions in person, so maybe they fear man—as they should. A transient lion may not and could be the first to test a human as prey. Somebody should point that out to “Mr. Mayor”. Wolves were seen in the area where the lion was found killed and the conservation officer, who did not conduct a necropsy, says there were punctures on the lion’s hindquarters, back, and two deep punctures on the neck he thinks were the fatal bites. So wolves MUST have killed it? Maybe it’s just me, but the headline isn’t proved by the information provided. Wouldn’t it be more responsible to say wolves “may” have killed it? They are certainly capable of it, but replace the lion with a cow or elk and I doubt most wolf supporters would be so readily accept it was killed by wolves. We should apply equal scrutiny whether we are defending wolves or not. Just a note, Brian Ertz posted the article and the followup article. I have been in Arizona on an great exploration trip for almost a month. I just got back to Pocatello, Idaho today. I don’t believe they are vocal because the wolves kill the cats, its more the recent lossed of packs of hounds to wolf packs while pursuing cougars. As a resident of AZ, where in AZ did your travels take you. I started at Lake Mead and made my way to Yuma after visiting the Kofa Mountains. I spent a week doing this. Then I took Interstate 8 to Gila Bend and down to Organ Pipe and the Cabeza Prieta NWR. Then across the Tohono O’odham Nation to Tucson. I drove south to Sonita and over to the Whetstone Mountains for exploration, then the Dragoons. Then I went to Bisbee for a while. Then up to the Chiricahua Mountains for a while. From Willcox, I followed US 191 to Alpine and then north across the Navajo Reservation to Bluff, Utah (actually I camped and explored Comb Wash, not Bluff). Then I drove straight home after a stop at my daughter’s in central Utah. I tried to hike at least 2 miles each day. I could have spent a lot more time and would have liked to. It’s a beauty that is captivating. Did you get any good sunset photos? I am an Arizona native and have found no place in the world that can rival the sun going down over the desert. As far as the cougar, excellent pics Lynne. But this cat is no different than any other animal in a natural sense. It was a part of a cycle of things…it ended badly for him, but it is a fact of life in the wild. It is a beautiflul thing to witness nature in it’s real state, even if it is an example of the harshness of life. I have been posting some of the photos on Panoramio so that they will appear on Google Earth. I am not sure the point that you are trying to make with something no being managed. Management like “hunters” is a broad word. Its clear that wolves are a viable species and if you disagree ask Doug Smith who has been quoted saying just that. We have been successful in reintroducing the wolf, now we must be successful in helping them remain viable. This type of management doesn’t me kill them it means study, understand, educate ALL, and take steps to help keep them out of harms way. They are wolves and they are WILD like you say. The legal ethical pursuit of game that is engaged through far chase, purpose (food, population control), dedication (prior, during, and after the hunt), respect for nature, and objective to maintain a healthy and sustainable population for future generations to incompass and enjoy. A in-depth knowledge of the game, its habitat, and other species that are affected by the actions of one choice. Also to include very detailed information for the hunted territory not to be evasive, or negativly impact on the given ecosystem to benefit the sole person or persons. the problem i have is with the prevalence of the false belief that the wild is somehow responsible for some level of injustice inflicted upon man – or that the wild is responsible for providing an amount of bounty set by man – or that it needs us to make it right given we’ve already screwed it up. i don’t believe such things are right, let alone possible. whether it’s a self-described ‘hunter’ whining about some speculative lost opportunity or a rancher complaining about their so-called right to predator-free public landscape – the conversation is frequently pre-occupied with entertaining a false premise – i.e. that humans are in any way benefited by the idea that all else ought revolve around our fickle fancy. i disagree with this. i believe mother nature can fix the human element, and i experience it personally every time i wander off the road. in all likelihood, my little tirade was an eruption in response to frustration with this basic idea. the reason i give a rip is deeply personal, but it’s an experience of humility that i struggle to chase and live up to – something i learned in that experience i described in my previous frustration and that seems lost in both the hunter & rancher’s public whining – in the call for management, as if something being out of control is inherently worse off. Gary Schroeder is not interested in biology, ecology, fact, or even the most basic economics when he initiates some BS study on economic impact of wolves just as Monty Pierce isn’t interested in any of those things when he introduces legislation to slaughter bighorns. this lion being taken by these wolves … it’s the antithesis of ‘management’. it’s like jimbob mentions of the mayor – he just doesn’t get it. Perhaps if I say that mgt. is best when the focus is relative to the survival of a species for the future generations. Your wildlife view, or hunting whatever you do, is always in jeopardy because of the human element. We have a bigger impact on the environment than any other species bar-none. If we are not conscious of our choices to protect and preserve much of what we enjoy it will be lost forever. Wild as you call it today is a watered down version of wild 50 years ago, but some people want to make a difference. We want to see wildlife and nature succeed because these things are our passion. You are blind if you think mother nature is is keeping up with all the destruction humans are putting it through. Thus, I say give her a break sometimes and do ones part to help preserve what “wild” is left. Wildlife is like capitalism. Let the strong survive. Everything else well you get the idea. I am not sure what you experience when you go off-road but within just a few steps you will find a human factor. 6+ billion people live here now we impact in ways nature couldn’t fix for thousands of years. We can’t sit back and watch as it falls apart we must help any chance we get. Notice the word HELP…a form of mgt. Sounds like a hell of a trip. Went thru some potentially hostile country……Alpine, AZ, but some damn beautiful and diverse country. I sent you an e-mail with a question. Wondering if you plan on replying. Gee, Jeff N., I have to put in a good word for Alpine, AZ. Don’t know how much time you’ve spent in the vicinity, but I’ve been camping in the area looking for Mexican wolves often over the past eleven years, including a few nights completely alone within six or seven miles of the place. I’ve never had a problem either out in the field or at local businesses, with the exception of one surly waitress in a local cafe who was probably having a bad day. Not everybody is crazy about the lobos (although they have quite a few supporters), but most folks are pretty friendly to visitors. Check out the website of the White Mountain Conservation League to see what some of the locals are doing. I traveled through Alpine and bought some supplies with no event. I camped at a wildlife area about 10 miles to the NW (south of Springerville). I saw no wolves; didn’t really expect to. I kind of had to hurry through because I had been gone a month and needed to get home. I assume you’re referring to the Sipe White Mountain Wildlife Area of AZGFD. Actually, it lies at the far northern edge of the Hawk’s Nest Pack home range. There’s a 2008 dispersing male pup that has been found some five or six miles to the west of that area in recent weeks. It’s entirely possible you could have seen a wolf–or at least heard one–had you been very, very lucky. back to the cougar . . it seems like about a year ago I learned on this website that researchers had discovered that when adult cougars are hunted the teenage cougar replaces them and is not as wise or suited to survival in a certain habitat. It could be that this cougar just wasn’t smart enough and it could be that the wolves did people a favor in this instance. I really think we don’t know enough about animals to “manage” them. People look at a situation and make a decision on what happened but in reality we know very little about what we are looking at. We know so little about what happens in animal dynamics I have to laugh every time someone says we should manage animals. To manage insinuates that we know what is happening. . and we don’t. Oh yeah we have statistics and studies but they are imperfect at best, then we have politics and people who are afraid of anything that smacks of actually being “wild”. Even if a forensic scientist treated this kill like a human crime scene and really examined all the evidence we still wouldn’t know much. On another note: Lynn Stone thank you for the great pictures and keep up the good work. It is people in the field as much as you are who have a chance of understanding. Linda – you are welcome. Some of my friends have said the wolf-cougar story in the Mountain Express was the most interesting that they’ve read for a long time. 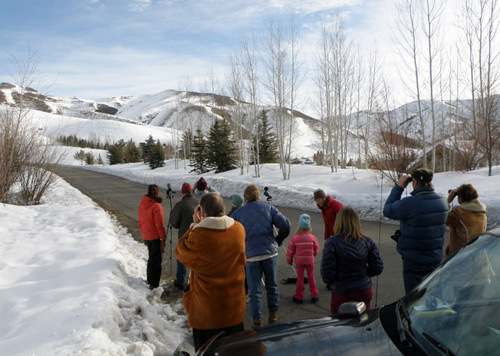 As I talked to scores of people on Saturday, March 7th, when the Phantom wolves were again in view all day from Sun Valley/Elkhorn, no one expressed fear of the wolves, rather, many locals indicated they are aware, and somewhat wary about mountain lions, which are quite common in this area. With wolf delisting imminent, you folks enjoying the Phantom Hill pack should make the most of it. Don’t know if the cooperative effort between Defenders of Wildlife, Lava Lakes, etc. will be in effect this upcoming sheep grazing season. If that program is not in place, this pack won’t last. I get a kick out of the com. made so far hear on this artical. the realty is this folks, this wolf is the largest of its kind and is not apart of this eqostem. if you are so concerned about the the the wolf you would do your home work and found that the native species in north america was still inhabiting yellowstone when they introduced the much larger canadian wolf (ask why the canadians made the us take sole responibilty of the relocation). I could give alt of examples why the wolf should be managed 1st. we put them hear and so it is our sole responsebility to care and havrvest them becouse of deseae or overpopulation ext…. note. there are now three Elk herds between motana, idaho and wyoming that are know extenint. but do we care enough to help the elk.. no we just say we are killing to many. rushia has a long and bloody histry of wolf atacks on humans and it has been documented hear as well and it is comming again mark my words on that if the population is aloud to out grow it ariginal estiments.